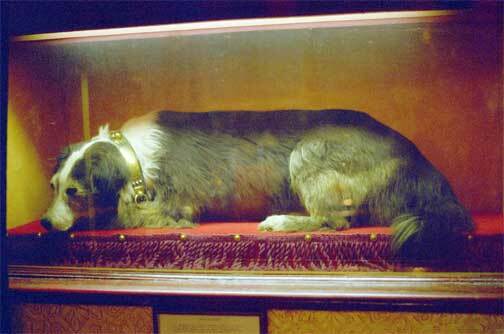 Willie known as "The stuffed dog"
Wondering Willie was a sheep dog. One day in 1873 he and his master were driving a flock from the Cheviots through North Shields when the sheep, frightened by the noise of the town , scattered in all directions. While rounding them up, Willie got separated from his master and by the time he returned to the quay-side where they departed, the shepherd had gone. Inconsolable, the dog remained on the spot for months, refusing to allow anyone near him , existing on scraps of food thrown to him by passers-by. Eventually, almost starved to death, he was taken on to the ferry and thrown overboard to put him out of his misery. He scrambled ashore on the other side of the Tyne however, and for months went back and forth to the ferry in the hope of finding his master. The story goes that about a year later the shepherd returned to North Shields but missed the dog by a few minutes. 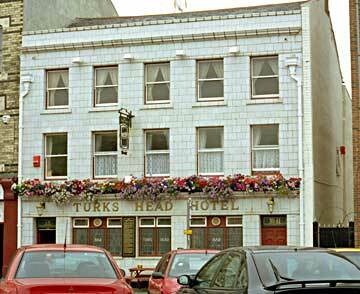 Willie at last died in 1880 and his body was stuffed by the brewers who then owned "The Turks Head". The legend of Willie was made into a play called "Dog of the Tyne"